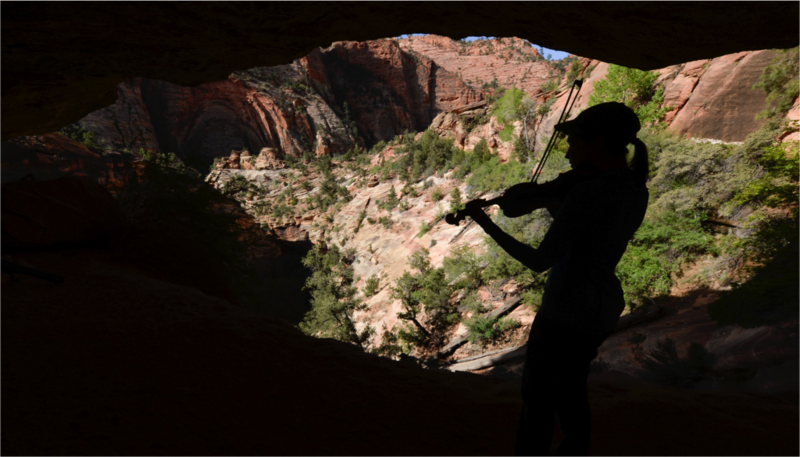 Violinist/Composer Rachel Panitch in Zion National Park during 2014 Artist Residency. Photo: Francisco Kjolseth, Salt Lake Tribune. Boston, MA – This April, the epic landscapes of Zion, Grand Canyon, and Yosemite will be brought to life in Boston. New Music of Our National Parks is a concert of new chamber music inspired by nature, commemorating the centennial of the National Park Service. Cardamom Quartet is joined by vocalist Burcu Gulec, flutist Alicia Mielke, guitarist Devin Ulibarri, and the vibraphone/violins trio Thread Ensemble in this performance of music by Rachel Panitch, Linda Chase, and Nell Shaw Cohen. Panitch, Cohen and Chase are members of the Landscape Music Composers Network, a group of composers from across the country whose music engages with and reflects upon landscape, nature, and place. The concert will take place on Friday, April 15, 2016 at 8:00pm on the monthly Advent Library Concert Series at The Church of the Advent in the heart of historic Beacon Hill. Suggested donation is $10. Rachel Panitch presents works she created as Artist-in-Residence at Zion National Park in Utah, including Impressions: Zion Canyon for string quartet, a selection of fiddle pieces performed with cellist Ariel Friedman, and structured improvisations performed with Thread Ensemble. These works are Panitch’s musical interpretations of Zion’s striking geological forms, as well as her experiences hiking through the park and interacting with visitors during her four-week residency. Linda Chase’s residency at Grand Canyon National Park gave rise to the creation of two works featured on this program, both scored for voice and string quartet: Beyond Eternity, which Chase describes as “a song to the Grand Canyon,” and Bell Tower, inspired by a Rainer Maria Rilke poem. These pieces, which “honor the natural world and speak out against injustice,” are Chase’s response to the uranium mining industry that continues to threaten the Grand Canyon. Dai-Shizen (Great Nature), a piece for flute and guitar by Nell Shaw Cohen, celebrates Yosemite National Park through the woodblock prints and watercolors of Japanese-American artist Chiura Obata (1885-1975). Cohen’s music follows Obata’s journey from Yosemite to an internment camp where he was imprisoned during World War II. “I was particularly inspired by Obata’s ability to follow nature as a source of artistic inspiration and spiritual harmony throughout the best and worst moments of his life,” Cohen explains. Never has there been a better time to celebrate national parks than 2016, the centennial year of the National Park Service. The Landscape Music Composers Network is commemorating this occasion with its inaugural concert season in Boston and New York. New Music of Our National Parks will be followed by another concert of chamber music inspired by national parks, presented on September 9, 2016 at the Parrish Art Museum on the East End of Long Island, NY, performed by the acclaimed New York City chamber quartet Cadillac Moon Ensemble. Burcu Gulec was born in Ankara, Turkey. She has performed internationally, including several appearances under Turkish National Radio Television (TRT), broadcasting to Eu-rope and the U.S. She has performed with Turkish Stars of Harmony Jazz Orchestra (TURKAY) and at international Jazz Festivals in Turkey. She is currently pursuing her Masters degree in Contemporary Improvisation at New England Conservatory. Devin Ulibarri has compositions published in Conceptions Southwest magazine, a range of teaching experience—from preschool to college level—and has performed with artists such as Silk Road Ensemble with Yo-Yo Ma. He holds two college degrees in music, a BM and MM in Classical Guitar Performance from the University of New Mexico and New England Conservatory, respectively. His studies at the New England Conservatory were under the tutelage of world-renowned musician, Eliot Fisk. Linda J. Chase is a composer and improvising flutist. She has collaborated with poet Jane Hirshfield for a concert of music and poetry, received a fellowship from the Japan Foundation to explore the relationship between sound and silence, and spent a month as Artist in Residence at the Grand Canyon. Ms. Chase works a Professor of music at Berklee College of Music, and leads the Interdisciplinary Ensemble at New England Conservatory. Her interest in interdisciplinary arts has led her to write a book on musical collaboration called, Painting Music, Dancing Poems. She is currently working on her PhD in Sustainability through Music Education focusing on Ecomusicology and holds degrees from Evergreen State College, Berklee College of Music and New England Conservatory of Music. She is currently pursuing Spiritual Ecology through Music and has been composing pieces for chamber groups to bring light to issues of environmental and social injustice. Ms. Chase has written for many chamber combinations, choir, spoken word, jazz songs and has recorded 6 CDs of original music.